With skill shortages in Western Australia raising concerns within the shearing industry, industry professionals are calling for the Australian 457 visa programme to be expanded to allow migrant workers to fill the labour gaps. WA Shearing Industry Association Executive Officer Vicki Gates is reportedly liaising with Rural Skills Australia in an attempt to get shearing on the list of skills shortages in a hope that migrant shearers can be eligible for an Australian 457 visa. 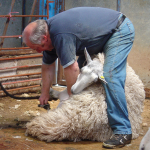 “Shearing happens between the peak periods of January to March and August to November so it’s now extremely seasonal, making finding workers tougher,” said WASI President Darren Spencer. The fruit picking industry has benefitted from Australian immigration allowances, bringing in thousands of workers to help during seasonal harvest times. Mr Spencer says that there is already interest in shearing opportunities from migrant workers, more so than native Australians. Mr Spencer claims there are plenty of overseas workers, particularly from Scotland, who wanted to come and put their skills to use in Western Australia but that visa restrictions were preventing them from doing so. “If the government was able to remove some of the red tape surrounding obtaining a visa it would help solve some of the skills shortage in the shearing industry.